Who doesn’t enjoy a delicious roast chicken dinner? Like most families who are rushing to get dinner on the table, we sometimes resort to picking up a grocery store rotisserie chicken and make some side dishes to go along with it. But honestly, roasting chicken is so easy and effortless and I’ve got the perfect recipe for you! 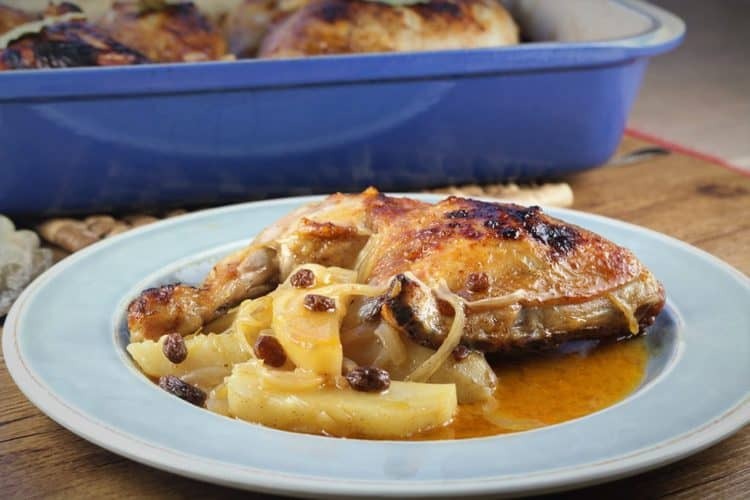 This Roast Chicken with Potatoes, Onions and Raisins is a dish I grew up eating. 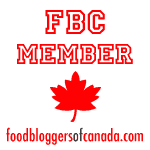 It’s a perfect for a weekday family dinner or weekend entertaining dinner. It does take an hour to bake, but it can easily be prepared the night before and reheated for the next night’s dinner. The key ingredients that flavor this dish are the raisins, bay leaves and white wine. The raisins become plump as they absorb the juices and wine while roasting. The unexpected sweetness when you bite into a raisin perfectly compliments the other ingredients. Raisins are often incorporated in savoury Sicilian dishes such as braciole, meatballs and stews. Pine nuts are also often combined with the raisins and this is a duo I’m planning to experiment with in the near future, so stay tuned! Another important step in this recipe is the browning of the chicken pieces before roasting. You want to get that crisp, golden skin for extra flavor before baking. 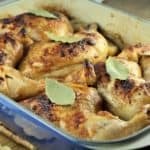 I prefer using chicken legs with the thighs attached since I’m partial to dark meat but you can use chicken breasts if you prefer, just stick to bone-in and skin-on pieces. Don’t forget to pour those delicious juices that accumulate at the bottom of the pan over the chicken when serving. That’s where all the flavor is, as well as those tasty raisins! If you try out this recipe, don’t forget to tag me with @mangiabedda on Instagram so I can see your lovely creations. Buon appetito! The unexpected sweetness as you bite into a raisin in this dish perfectly compliments the chicken, onions and potatoes. Roast Chicken with Potatoes, Onions and Raisins is the perfect family dinner or weekend entertaining recipe! Place sliced onions and potatoes in a roasting pan and toss with 1 tbsp. olive oil, salt and pepper. Sprinkle raisins over the vegetables. Preheat oven to 375F. Combine paprika, salt and pepper and sprinkle evenly over both sides of the chicken pieces. Heat 1 tbsp. 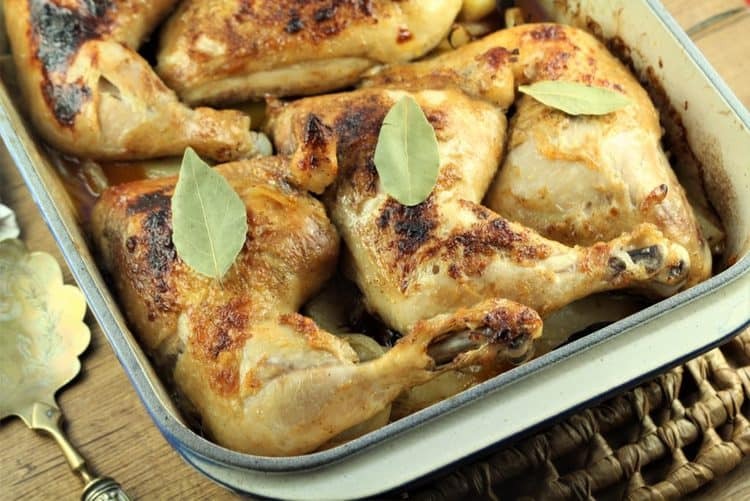 olive oil in a large skillet and brown the chicken 3-4 minutes on each side. Place in the prepared roasting pan over the vegetables. Place a bay leaf on each chicken piece. Pour the white wine around the edges of the pan, not over the chicken. 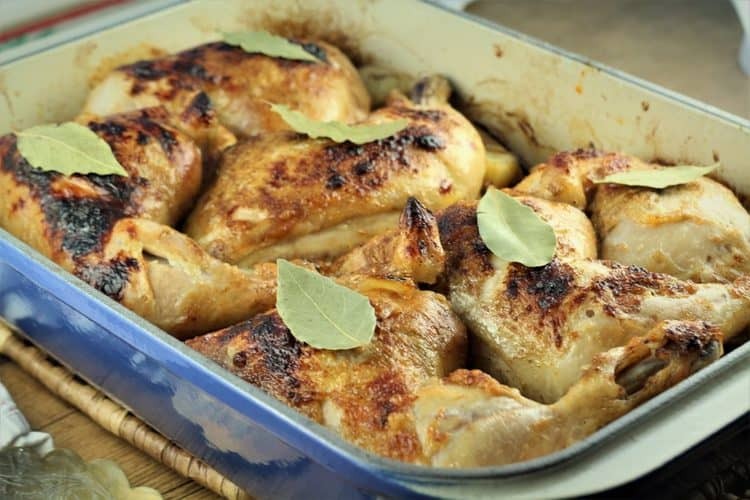 Bake in the preheated oven for 1 hour, flipping the chicken halfway, or until a thermometer registers 180F. For extra colour, broil for 2 minutes, flip the chicken and broil the other side for 2-3 minutes. Serve hot.